Talmoi Amateur Picnic Race Club President Justin Ramsay, left, and Northern Tablelands MP Adam Marshall inspect the new facilities at the Talmoi track at Garah. A $14,000 funding flush for a new modern toilet block at the Garah Racecourse has helped the local picnic race club close the lid on a bygone era – and consign the old long-drop dunnies to the history books, Northern Tablelands MP Adam Marshall said today. Mr Marshall announced the State Government funding for the Talmoi Amateur Picnic Race Club, which runs its big annual race day at the Garah track, as part of the Golden Triangle picnic races circuit. “The Talmoi picnics is one of the oldest picnic race days in Australia; it’s been going for 107 years – and this year there’s really going to be something new to see on the course because of this funding,” Mr Marshall said. Club Treasurer Cara Moore says the funding win is great news for everyone. 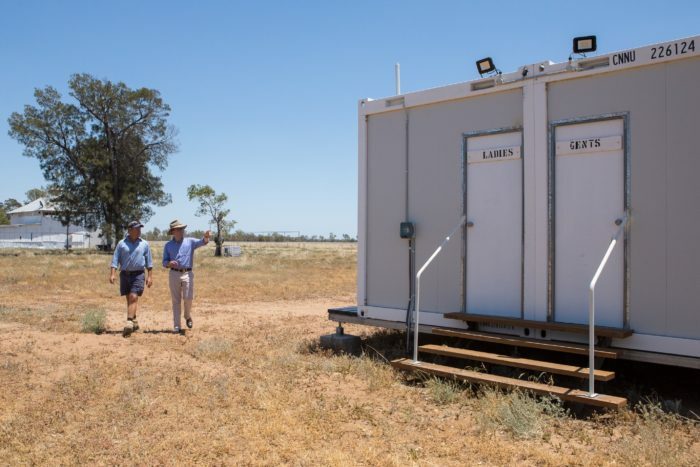 “The old men’s toilets are fairly ancient and could get pretty smelly and this year we had a demountable block brought in and hired port-a-loos to do the job,” Miss Moore said. “But the funding for the grandstand, and now for the new toilet block, is not just for racing, it’s a community benefit, because these upgrades mean that the racecourse is attractive to other users as well. Talmoi Amateur Picnic Race Club President Justin Ramsay said that the upgrades would open up the club to the entire community, because with better facilities, they could get groups like the local school to hold fundraisers there, and even weddings and other social events.